There are a great many people who are deserving of sincere thanks for helping me achieve the nomination and I don't have time to list all of them - but they know who they are. 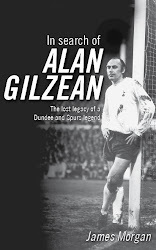 Primarily, though, I want to say a special word to my publisher BackPage Press for having the guts and the faith to take a punt on an unheralded author and for putting up with my constant handwringing during the writing process - the support given to this inveterate worrier was invaluable and the way in which Martin Greig, Neil White and James Porteous went about promoting the book ensured that it became the success it did. Indeed, their micro-marketing and adherence to modern publishing methods should serve as a salutary lesson to some of the bigger, more established names. There is one other person deserving of my eternal gratitude, too. Thanks Gillie. PS. Get well soon, Whitey. We've an awards dinner to attend and several bottles of expensive *free* wine to consume.